So, you’re completely fed up with your garden and you’re in dire need of a new, more practical and attractive outside area. Amongst factors such as time, money and stress, one major factor that could put people off investing in a functional garden is the design element. Maybe you lack creative mind set and wouldn’t have a clue where to start or maybe you lack knowledge on products. Luckily for you, today there are more and more tools to help you design and reach a dream garden. Firstly, you can use the Marshalls Scrapbook tool to help you find products and start looking at various design options. Here, you can select your favourite products and put them in one place to compare them. If you can’t design a scrapbook of your own, you can gain inspiration from readily made scrapbooks, with styles ranging from traditional cottage to tranquil or vintage retro. After you have a rough idea of the products you may want to use, you can start to contact various landscaping companies, where they too should further advise you on products and design features and options. Don’t go with a company who aren’t willing or able to suggest any products or design options. Reputable landscaping companies will have had tons of experience in designing gardens and therefore should have a wealth of knowledge to pass on to you. Whilst you don’t want them having the last say on everything designing your garden, they should show you a portfolio of their completed work, so you are able to see the standard of their design and installation work. Computer Aided Designs are often created to help give a rough idea of what your dream garden will look like. They usually show a rough plan of the layout of the garden, as well as a key which shows your chosen products. Choose a landscaping company with a resident designer. 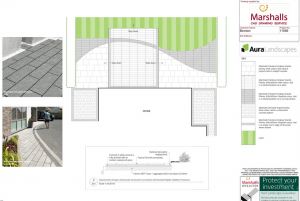 If CAD designs don’t help you envisage your dream garden, some landscaping companies will offer hand drawn designs – of which give intricate impressions of what your garden should look like. 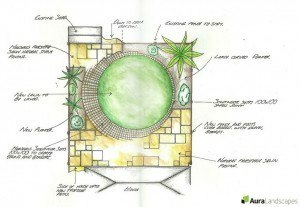 These designs show the products, laying options and colours to be used, which often give home-owners a clear vision of their future garden. 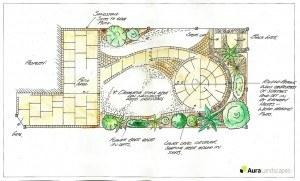 Where CAD designs are useful, home-owners who seek a clear plan for their garden should invest in a hand drawn design. To conclude: Always make sure you have a clear design and plan of your garden before you agree to go ahead so you can know what to expect at the end! You can have a look at some of our garden designs here or you can start creating your scrapbook at http://www.marshalls.co.uk/scrapbook!